Northern British Columbias Monkman Pass Memorial Trail Hiking Route is an unforgettable hiking route that includes major waterfalls and rivers, lakes, temperate boreal forest, as well as alpine meadows and alpine summits. 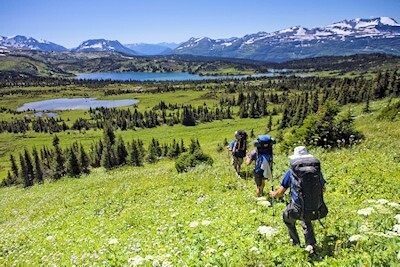 This is an average six day journey on a wilderness trail that leads through magnificent, remote, untouched mountain terrain, filled with an with inspiring and tangible history, and sightings of Grizzly and Black Bears are numerous. 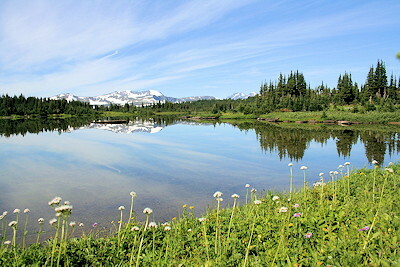 This hiking trail, a true wilderness experience, follows the route that Alex Monkman and pioneer residents created in the 1930s. Monkman Pass was surveyed as an alternative route through the Rockies, but the highway was never built. The majority of this spectacular, but little-known trail is in Monkman Provincial Park. The trail leads from one of its most famous features the Kinuseo Falls, and over the Rocky Mountains to Hobis Cabin on the Herrick River. Monkman Provincial Park, south from Tumbler Ridge, rewards you with the Kinuseo Falls. Your adventure starts from the campground, that's 45 km (28 mi.) from Tumbler Ridge. A short walk from the Kinuseo Falls Campgrounds will take you to a viewing platform. Both the sound and spray of the falls needs to be experienced to be appreciated. A hiking trail from the campground will take you into the middle of the park and the Murray River Crossing. The south end of Monkman Lake is a 24 km (15 mi.) hike. There are primitive camp sites in this region which is bear country. Keep food away from your sleeping area, keep the area clean and watch for these four legged creatures that call this home. Stone Corral Trail, one of Monkman Provincial Parks most notable hikes, which leads visitors to small caves with stalactites, moonsmilk and other limestone formations. boreal, subalpine, alpine, and Columbian forest. The region traversed by the trail is remote rugged wilderness and the trail is classified as difficult. The park offers a diverse and inspiring landscape of jagged peaks, forested valleys, unique geological formations, pristine lakes and alpine meadows.